Bathroom with bath, separate walk in shower, toilet, wash basin, shaver socket, wooden floor. Kitchen with microwave, dishwasher, ceramic hob, electric oven and fridge freezer. Living room with leather sofas, wooden floor, cast iron electric stove plus flat screen TV, Sky+ HD, DVD and broadband. Washing machine and tumble drier plus eco detergent and fabric conditioner included. "The welcome you provided was wonderful; we especially enjoyed the cake and marmalade." "Beautiful little cottage. 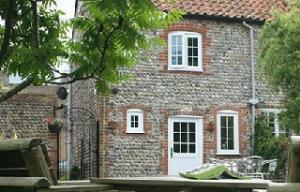 Very well equipped and with a lovely garden." Enclosed gardens back and front. Children welcome from any age. The nearest train station is Cromer or North Walsham. There is a regular bus service into Mundesley from Cromer, North Walsham and Norwich. There are two main routes into Mundesley, either from the west, via Cromer or from the south, via Norwich and North Walsham. Take the B1145 road into Mundesley and turn into Beckmeadow Way alongside the Royal Hotel.